Imagine the countryside dotted with cattle. Replace the image of cattle with camels. Now picture herds of camels loping across the desert sands, trailed by a white-robed shepherd. This is the enduring vision I will keep of Abu Dhabi and Dubai. Not the skyscrapers that soar high above the Persian Gulf, nor the Emiratis shrouded mysteriously in abayas and kanduras, but this majestic animal icon of their history. For centuries the Arab tribes roamed the desert, bedouins whose simple life revolved around the camel. The camels carried them across the vast windswept sands, provided milk and yogurt and meat, and eventually gave up their skins and hair and even their bones for tents, clothing and other necessities. A man’s worth was measured in part by the number of camels he owned. The camels have long since given way to Ferraris and palaces and other lifestyle choices of the rich. But the Emiratis still keep herds of camels, perhaps to remind them of the humble roots that preceded their oil wealth. Even today, they race their camels and take great pride in winning. There is even a camel beauty contest. I had a brief immersion course in ‘camel’ on my trip to UAE. 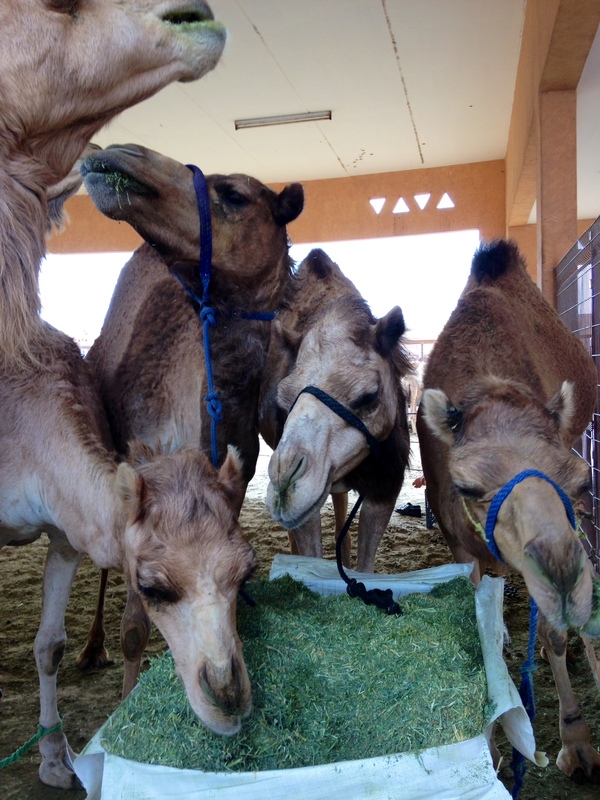 We stopped by the race track at Al Wathba and watched the camels train. Then on to Al Ain, an oasis surrounded by 3,000 farms and the highest concentration of camels in the world. As we drove to Al Ain, herds of camels appeared now and then against the beige and rust-colored sand. When we pulled over to the side of the road, the inquisitive animals would come right up to the fence line to ponder us. They are handsome – white (primarily from Sudan), brown and black (Saudi Arabia). These are one-hump camels, known as dromedary. They can go two weeks without water and they can live for 50 years. Their small heads are dominated by doe-like eyes and comically ridiculous lips and teeth, offset by narrow mid-sections. Their giraffe-like legs taper to plate-sized padded feet. They make the craziest sounds (audio/video here). Al Ain still houses a camel souk in the plains below Jebel Hafeet, the brutish limestone mountains that separate Dubai from Oman. The market is divided into more than 100 neat pens, where a thousand camels (and goats, sheep and cattle) are corralled for potential buyers to ogle. Expensive white SUVs slowly circle the paddocks, often filled with parents and children, selecting the camels or other animals they want to buy. A camel destined for slaughter goes for 3,000 dirham, or about $850. (At the market, camel meat is cheap – less than $3 a pound.) A cow, which will provide milk and birth calves for years, sells for 10,000. 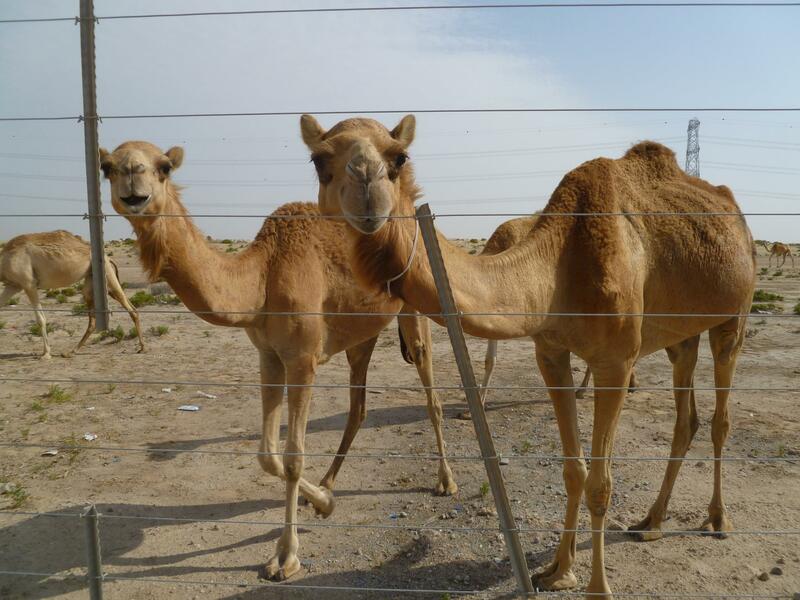 And a fortunate leggy animal chosen to work with the highly-prized racing camels can fetch 24,000 dirham. We lingered at the camel souk, enthralled by the beautiful beasts, from week-old babies to full-grown animals that top 7 feet high. On the drive back to the city lights, it was easy to dream of the centuries when man and camel roamed the endless desert, before oil rigs rendered the camel obsolete.